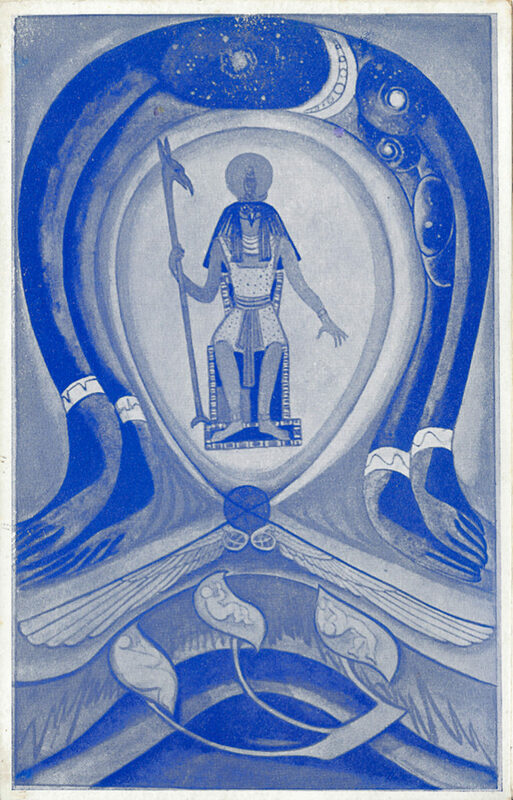 Liber OZ,* which Crowley initially referred to as the “War Aims of the new Aeon”, was compiled over several months in the latter part of 1941 and during the second World War. This Proclamation of Man’s rights, drew almost entirely from two previously written sources; Liber AL vel Legis and the rituals of the Ordo Templi Orientis. With the war raging in Europe, Crowley was confronted with Man’s need for change and desperately wanted to tear down the barriers of old aeonic thinking. With OZ, he was able to focus the full force of his Magical intent towards this end. 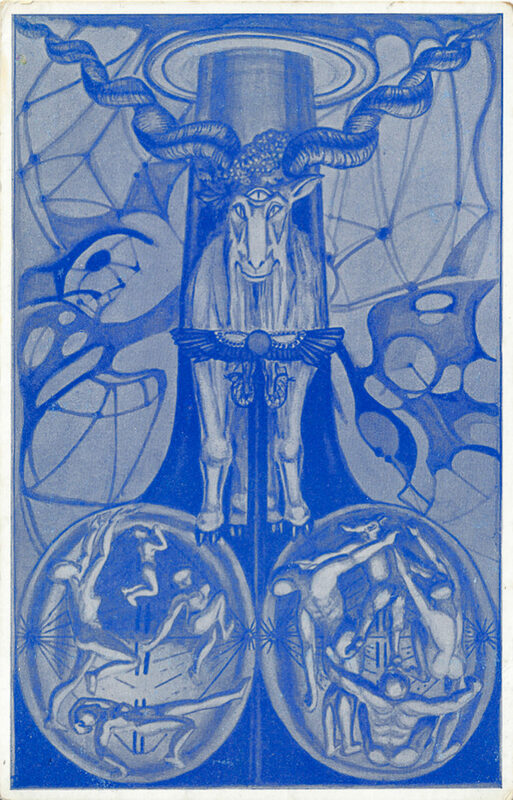 To Crowley, OZ was one of several propaganda pieces he would produce in efforts to aid the war; but it was also a Magical talismans written with the explicit purpose of causing change in the world – and in direct response to conditions Crowley viewed as tyrannical or oppressive in nature. It’s a Magical proclamation expounding upon the Law of Thelema with the aim of guiding humanity forward, and Crowley believed, provided a practical code of ethics for all Thelemites. 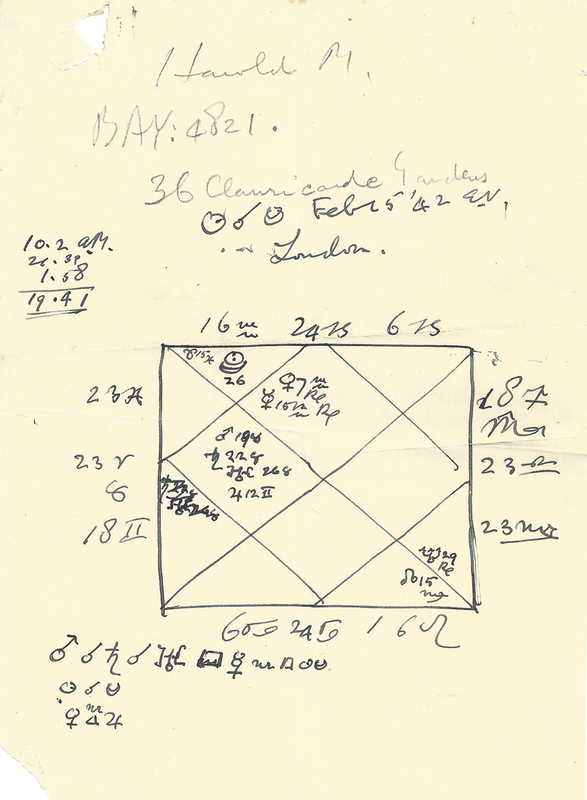 Astrology chart presented to Mortlake. Crowley completed his first full draft on the morning of October 10, 1941 and then decided to share it with Gerald Yorke, Harold Mortlake, and Robert Cecil- the latter while chatting with him at the Masons Arms, a pub not far from where Crowley lived. Mortlake was a friend of Gerald Yorke and a local bookseller. Crowley recorded in his journal that all three “highly approved” of War Aims and that Cecil and he shared “a very pleasant talk, all too short.” Crowley, who often prepared charts for acquaintances, later presented Mortlake with a chart penned on the obverse side of an early OZ printer proof. There were two versions of the first edition of OZ issued. Both printed by Apex Printing and identical in every way, save that one featured a picture of the Devil Atu and the other, that of the Aeon. 300 in total were printed, (50 Devil and 250 of the Aeon). It was a single sheet of paper, printed on both sides measuring 7 1/2″ x 4 3/4”. Formally “Published by the O.T.O. at the Abbey of Thelema, Rainbow Valley, Palomar Mountains, California. And at Hanover Square, London, W.1. An lxv Sol in O° Capricornus”. Both versions are printed in a dark blue hue which matched the print on the obverse side. 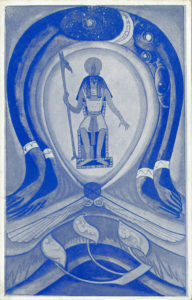 These cards were also the first official publication of any of the Thoth deck’s images. Throughout this period a social experiment known as the Mass Observation project became somewhat of a cultural fad in England. Beginning in 1937, it was a research project whose goal was to record the everyday life and thoughts of the common citizen and was at its peak of popularity during the second world war. Hundreds volunteered their time and effort to poll their fellow citizens, recording their thoughts on a wide variety of issues. Others agreed to keep a daily journal for the sake of the project. Everything from bathroom behavior to sexual proclivities, etc., was examined, polled and tabulated. The published results fascinated the British people and today this vast archive of film, pictures, journals, and interviews is housed at the University in Sussex, England. Crowley, ever the opportunist, seized the occasion to piggy-back on the project’s success and encouraged initiates to hit the streets and poll the general populace’s response to Liber OZ and report back to him their findings. 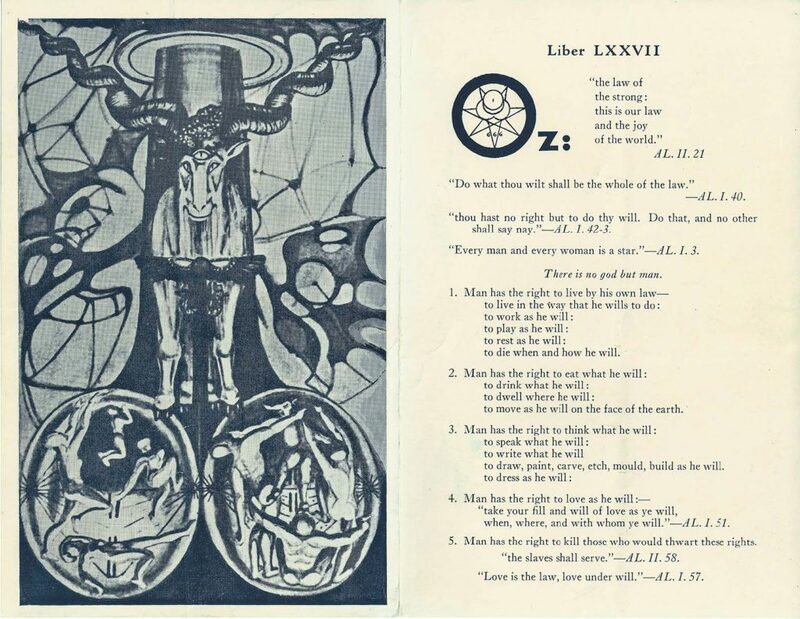 He also encouraged them to post copies around town, nailing them “to church and town hall doors” – from here stems the tradition of sharing OZ while engaging others in conversation regarding the Law of Thelema. The final edition of OZ released during Crowley’s lifetime was published in The Oriflamme (Vol. 1 No. 11) on the 21st of June, 1945. 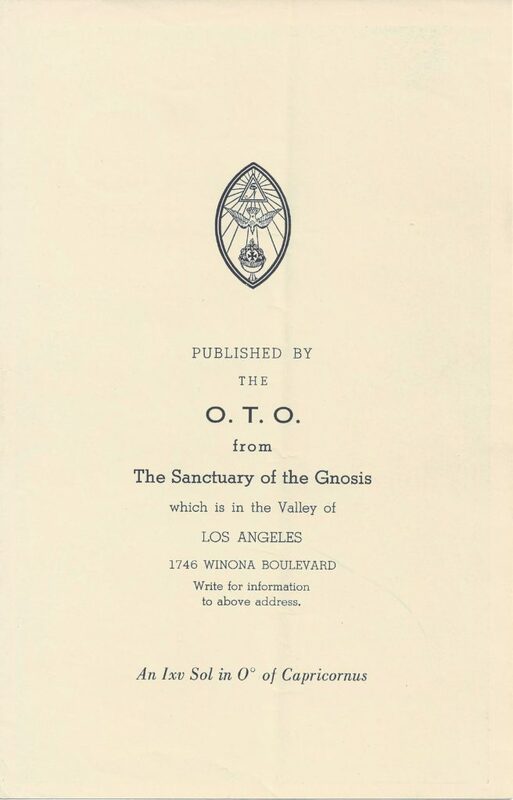 Also included in this volume was a brief introduction to the O.T.O. along with the Preliminary Pledge form, a short list of available publications, and Crowley’s poem “Anthem” from Thumbs Up!. This publication of OZ bears a distinction from all others, in that W.T. Smith added a footnote to section 5 (“Man has the right to kill those who would thwart these rights.”) which directs the reader to “See 2nd Amendment, Constitution of The United States”—which is the right to bear arms. 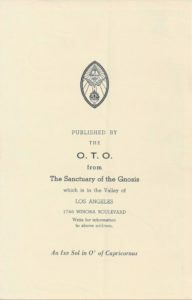 I am unaware of any other occasion wherein OZ is footnoted in an official publication of the Ordo Templi Orientis. I am unaware of any correspondence which verify that Crowley was aware of this footnote. However, generally speaking – we do know that Crowley was not opposed to the private ownership of firearms having himself obtained a Firearm Certificate for a Webley 45 Revolver while living at 89 Park Mansions, Knightsbridge, London in the early 1930’s. So it is entirely plausible that he may of approved of Smith’s alteration. 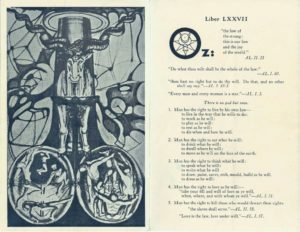 Believing that Liber OZ was perfectly suited for attracting new aspirants to the O.T.O.—most especially in the United States, Crowley continued to urge Order members to share it with acquaintances right up to his death in December of 1947. Today, OZ is in all likelihood the most widely published, distributed, and recognizable of Crowley’s works—a true cornerstone of the Thelemic community. In the end, it would be Crowley’s last Proclamation to Mankind – and arguably his finest; as relevant today, as it was to the war-torn Europe of the 1940’s. 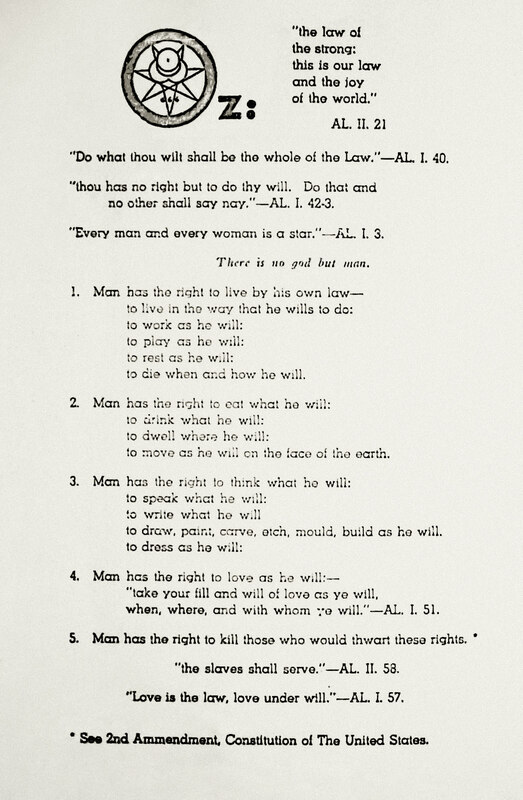 *These notes have been excerpted from “On the Rights of Man” —A study by Frater Orpheus.